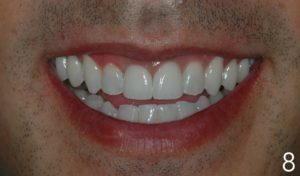 The patient came to Dr. Geach with two chipped porcelain veneers on the upper front teeth. The gum tissue next to the veneers was also red and inflamed. Upon removing the veneers and performing an in-depth examination, Dr. Geach found that the patient was suffering from contamination in the teeth’s root canals (the inner most part of a tooth, which contains its nerve and pulp). Before Dr. Geach could replace restorations on the teeth, he had to refer the patient to a local endodontist, a dentist in downtown Los Angeles who specializes in treating issues that affect tooth pulp. The endodontist performed retreatment of the patient’s root canals in order to clear out the infected area and stop the problem from becoming even more serious. They also created space within the teeth for new posts what would eventually support dental prosthetics. Dr. Geach’s cooperation with an endodontist illustrates the point that a prosthodontist often serves as the “quarterback” of a patient’s dental team. They plot out the course of treatment and coordinate procedures in a way that is best for the patient’s oral health. When the patient returned to Dr. Geach, he placed red buildup material on the teeth to serve as a model for Dr. Geach’s in-house dental laboratory. Lab technicians used the information to create the gold support posts that you see in figure 5. 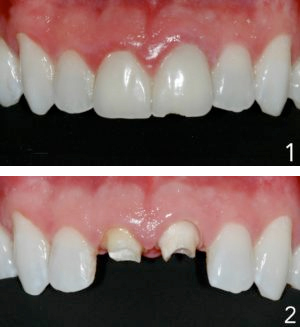 Following that, Dr. Geach designed zirconia crowns to restore the shape of the teeth. 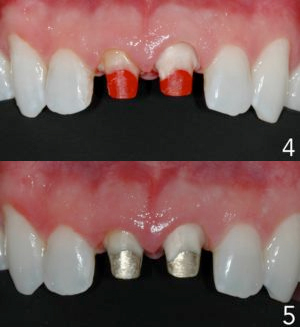 A thin layer of porcelain was placed over the zirconia to give the crowns the most natural appearance possible. As you can see in these final photographs, the end result of the treatment is stunning! Since the crowns were special designed to block the gold color of the posts behind them, the teeth do not appear too dark. The porcelain layer on top of the zirconia makes the crowns mimic the light-reflecting qualities of natural tooth enamel. Now, the patient can once again enjoy robust dental function and a confident, attractive smile. Could You Benefit from a Visit to a Prosthodontist? Dr. Adam Geach earned his certificate in prosthodontics from the University of Connecticut School of Dental Medicine in 2009. Since then, he has specialized in cosmetic and restorative services, from simple fillings to complex full-mouth constructions. He also offers basic preventive care and invites patients to make him both their trusted specialist and their regular dental care provider. If you would like to learn more about Dr. Geach, his qualifications, or our dental practice, get in touch with us at 213-622-3339.